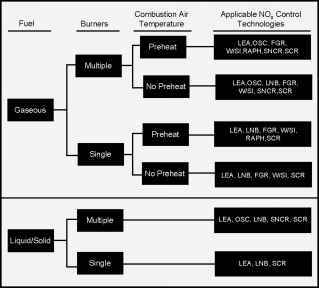 While SCR and SNCR control NOx emissions by treating the NOx after it has been formed in the combustion reaction, modifications to the combustion equipment or burners also significantly reduces NOx formation. 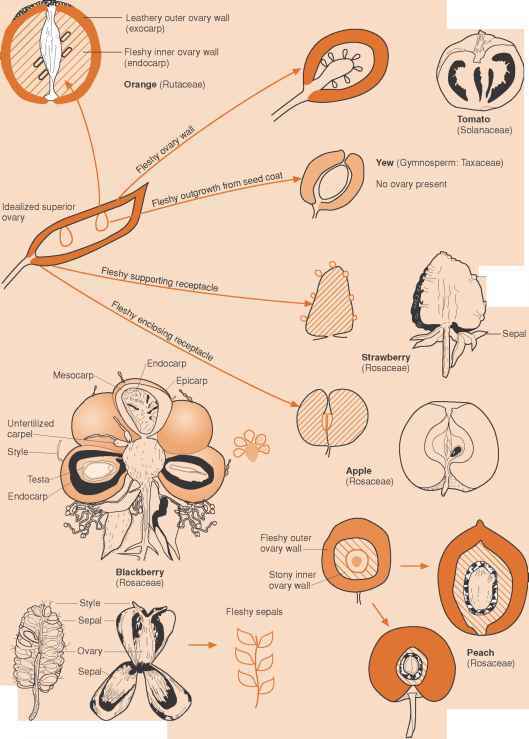 Using such modified burners has a number of advantages, the major ones being simplicity and low cost. At the same time, since burners are the primary component of a furnace, implementing new ones should be tried cautiously. the throat of the burner and is combined with the primary air, which flows through the venturi and burns (see the right side of Figure 5.19.4). Staged-air burners are simple and inexpensive, and NOx reductions as high as 20 to 35% have been demonstrated (Garg 1992). These burners are most suitable for forced-draft, liquid-fuel applications and lend themselves to external, flue gas circulations. The main disadvantage of these burners is the long flames, which must be controlled. In staged-fuel burners, fuel is injected into the combustion zone in two stages, thus creating a fuel-lean zone and delaying completion of the combustion process. This lean combustion reduces peak flame temperatures and reduces thermal NOx. 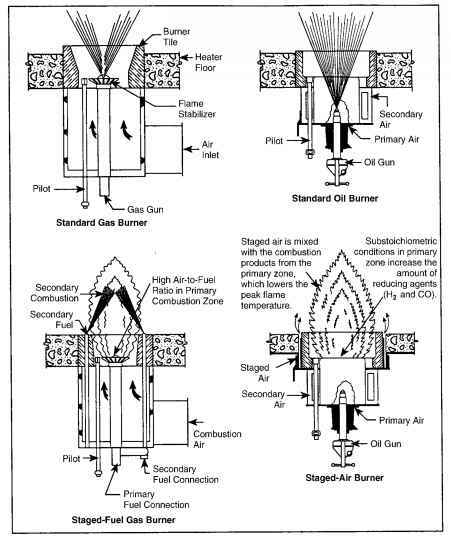 The remainder of the fuel-gas is injected into the secondary zone through secondary combustion nozzles (see the left side of Figure 5.19.4). The combustion products and inert gases from the primary zone reduce the peak temperatures and oxygen concentration in the secondary zone, further inhibiting thermal NOx formation. Some of the NOx formed in the first stage combustion zone is reduced by the hydrogen and carbon monoxide formed in the staged combustion. Staged-fuel burners can reduce NOx emissions by 40-50% (Garg 1994). The flame length of this type of burner is about 50% longer than that of a standard gas burner. Staged-fuel burners are ideal for gas-fired, natural-draft applications. induces recirculation of the flue gas (see Figure 5.19.5), creating a fuel-lean zone and reducing oxygen partial pressure. In staged-air burners with internal FGR, fuel mixes with part of the combustion air, creating a fuel-rich zone. 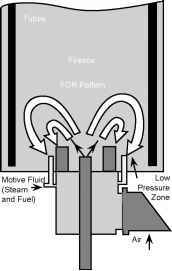 The high-pressure atomization of liquid fuel or fuel gas creates FGR. Pipes or parts route the secondary air in the burner block to complete combustion and optimize the flame profile. Air or fuel-gas staging with internal FGR can reduce NOx emissions by 55 to 75%. The latter design can be used with liquid fuels, whereas the former is used mostly for fuel-gas applications. Low-NOx burners have been installed in a variety of applications in both new and revamped plants. Table 5.19.2 summarizes the performance of several of these installations.